The Conference, organized by The Vietnam Vetiver Network was successful, interesting, and attended by participants from 23 countries. Special thanks to Van Man and Van Tran of the Vietnam Vetiver Network and their helpers for making the conference successful and friendly. 56 papers were presented and on the whole the quality was excellent. The complete Conference proceedings comprising text and Powerpoint presentations are available online. KING OF THAILAND VETIVER AWARDS ANNOUNCED The winners of the six awards are Mohammad Shariful Islam (Bangladesh), Liyu Xu and Biao Huang (China), Alain Ndona (Congo DR), and Malee Nanakorn, Tanapon Phenrat, and Songkiert Tansamrit (Thailand). Each receive US$2500. Also nine Certificates of Excellence have been awarded. The awards and certificates were presented to the recipients by TVNI's Patron, Her Royal Highness Princess Maha Chakri Sirindhorn of Thailand at ICV6 at Da Nang, Vietnam. Details of the awards can be found at this link. 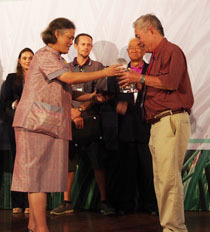 Paul Truong of Australia receives (left) Global Vetiver Champion Award from TVNI Patron, Her Royal Highness Maha Chakri Sirindhornfor 25 years service to the Development of the Vetiver Grass Technology with special reference to his work on the development of Vetiver Grass Technology for the decontamination of land and water; and for his mentoring and support to many young post graduate students working on vetiver as part of their thesis. Alain Ndona of the Democratic Republic of the Congo awarded Vetiver Champion Award for the introduction and dissemination of the Vetiver Grass Technology in Congo Kinshasha and Congo Brazzaville with specific reference to slope stabilization. Alois Kennerknecht of Peru awarded the Nick Dolphin Award (US$ 750) for the communal application of the Vetiver Sytem in urban areas of Lima, Peru. Luu Thai Danh of Vietnam awarded the Mark Dafforn Award (US$ 1,500) for his comprehensive review and compilation of Vetiver Grass Technology application for phytoremediation. 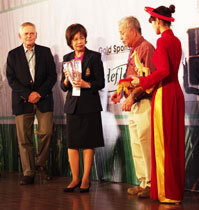 Kittima Sivaarthitkul of Thailand and her colleagues of the Land Development Department awarded the Monty Yudelman Award (US$ 2,500) for developing Vetiver Grass Tracking System for Thailand. Other TVNI awards can be found at this page. Suwanna Pasiri, Deputy Secretary General of Royal Development Projects Board, of Thailand receives a special TVNI Award from Paul Truong and Roley Noffke for 20 years of dedicated service in the support of the global Vetiver community. Suwanna has worked tirelessly providing reliable and generous back up support for Vetiver conferences, supply of Thai vetiver specialists, publications, and the Vetiver handicraft prgram. Thank you Suwanna - may you forever be a Vetivarian!! Vetiver System: Ethiopia - Soil and Water Conservation. Vetiver System: Ethiopia - Hassan Ali - Vetiver System Farmer of Excellence. Vetiver System: Ethiopia - Wetland Restoration - Wichi Wetland. ICV3 - THIRD INTERNATIONAL VETIVER CONFERENCE AND EXHIBITION -- VETIVER AND WATER -- October 6-9, 2003. Guangzhou, P.R. ICV5 - Ffith International Vetiver Conference - Vetiver and Climate Change, Lucknow, India. October 2011. ICV6 - Sixth International Vetiver Conference - Empowering Sustainable Develoment Da Nang, VIETNAM May 2015.